Big news: I may have discovered one of the cheapest homemade gifts ever. What is it? Homemade hand soap, made out of a bar of soap and water. One bar of soap yields enough hand soap to last for months. For some reason, I have an overwhelming abundance of individual-sized bar soaps at home, just waiting to be used. Some are from hotel rooms and some I have received as gifts throughout the years. When I saw the idea for making homemade hand soap in Richard Blais’ cookbook, Try This At Home, Recipes From My Head To Your Plate, I had finally found a practical use for all that bar soap. So here’s what you do: Make a batch of this homemade hand soap and put it in individual dispensers to give as gifts this holiday season. Once you discover how easy it is – and how much money you can save – you may never go back to store-bought hand soap again. This simple recipe could save you hundreds of dollars over time. I hope you enjoy! To get the recipe, head on over to Living Well Spending Less, where I’m guest posting today. 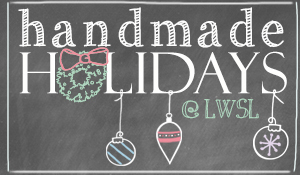 Each Monday, from now until Christmas, the site will be featuring a selection of handmade holiday gift ideas. I can’t wait to see what other DIY projects will be featured! And while you’re there, spend some time browsing Ruth’s site. It’s full of practical, money-saving tips that will help you live fabulously and on a budget. First time visiting Cheap Recipe Blog? I am so happy that you’re here! My blog is all about cheap and creative recipes and money-saving tips. If you like what you see, let’s stay in touch! Love this idea! I’ve been making my own laundry detergent for a few years now, and this process is similar. Love the idea of making a big batch of this to use throughout our house…any suggestions where to buy a soap pump? I would love to get your laundry detergent recipe/formula! About a year ago, I bought a box of Watkins dry detergent, which only requires a tablespoon per wash load. A year or so later, I still have about 1/4 of the box left. It does a great job of washing my clothes without leaving a strong scent behind. I love this stuff!